Betsy Fagin is the author of All is Not Yet Lost (Belladonna, 2015), Names Disguised (Make Now Books, 2014), and a number of chapbooks. She received degrees in literature and creative writing from Vassar College and Brooklyn College and completed her MLS degree in Information Studies at the University of Maryland where she was an American Library Association Spectrum Scholar. In 2011, Betsy served as a Librarian for the People’s Library of Occupy Wall Street. 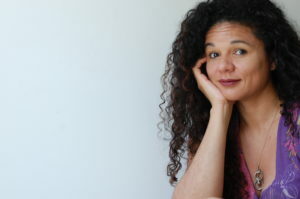 She was a writer-in-residence at the Lower Manhattan Cultural Council during 2012-13, served as Editor for the Poetry Project Newsletter from 2015-2017, and was awarded a 2017 NYSCA/NYFA Artist Fellowship in Poetry. A longtime meditation practitioner, Betsy has trained in Mindfulness-Based Stress Reduction and Mindful Self-Compassion. She teaches yoga and meditation as well as concentration and compassion practices in New York City centered on developing resource for the work of social justice and collective liberation.